Suspect arrested after gun found in yard in village where terrorists who murdered policemen near Temple Mount lived. 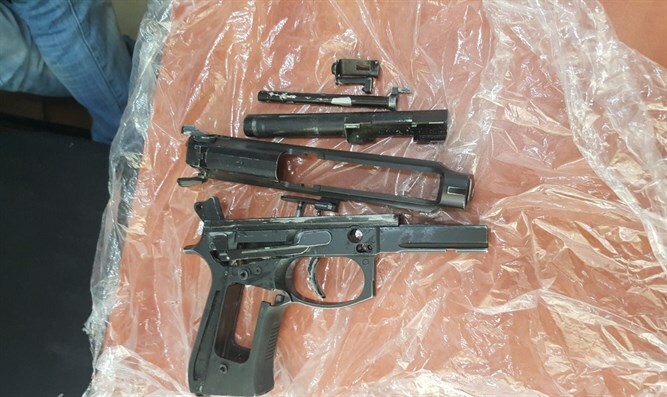 Border Police detectives found a handgun during a search carried out at a house in the village of Umm al-Fahm in Wadi Ara. The search, carried out with the assistance of a tracker, led the detectives to find the dismantled pistol in a hiding place in the yard. Several bullet casings were also found during the search. The suspect, a resident of Umm al-Fahm in his 30s, was arrested and taken for further investigation by the Border Police. The three terrorists who carried out the terrorist attack near the Temple Mount in which two Druze policemen were murdered last month came from Umm al-Fahm. Thousands attended the terrorists' funeral. The bodies of the terrorists were greeted with joy and fireworks during the funeral.